Maintenance on the Labasa Bridge had to be carried out before the sugarcane crushing season begins says Fiji Roads Authority Chief Executive Officer, John Hutchinson. 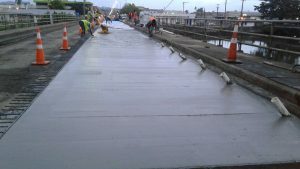 Mr Hutchinson adds that with school starting this week, the FRA engineers and their contractors are working to meet deadlines and have this bridge opened to two lanes of traffic by the 20th of May. 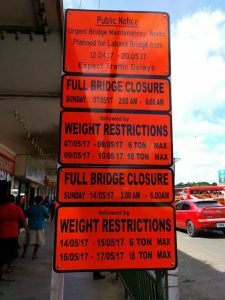 “On Sunday 07th May, concrete was poured on one lane of the Labasa Bridge and curing time meant that a weight restriction had to be placed on the bridge and is expected to be lifted today. Mr Hutchinson says that the Labasa Bridge is vital to the movement of goods and people in the area and the FRA is fully aware of this. He added that in addition to the bridge deck work; the strengthening work on the bridge beam is not visible to the public as this work is taking place beneath the bridge deck and that the maintenance crews were accessing the underside of the bridge by pontoons. Mr Hutchinson adds that these signs were posted onsite weeks in advance of the work and FRA had carried our consultations with stakeholders in early April in advance of the closure. Members of the public are requested to contact Fiji Roads Authority on 5720 or visit the Fiji Roads Authority Labasa Branch Office located at Lot 10 Sangam Avenue.